President Nana Addo Dankwa Akufo-Addo has assured the chiefs and people of the Dorimon Traditional Area in the Upper West Region that government would give consideration to their request for a new district. 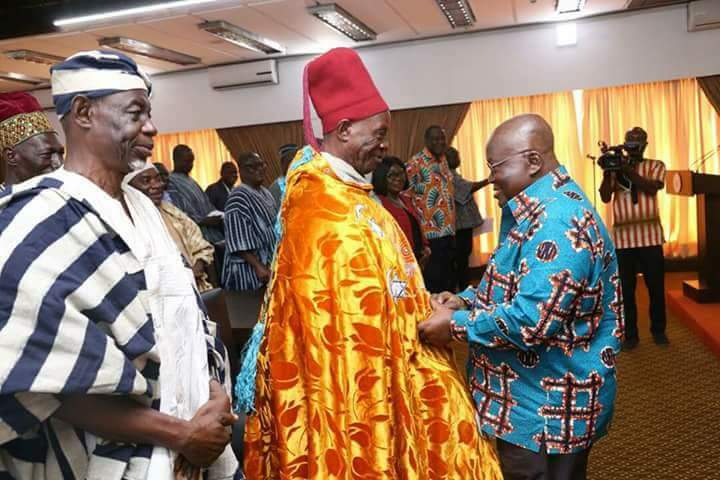 This followed a request by a delegation from the Traditional Area, led by the Paramount Chief, Naa Sohimwiniye Danaa Gori II, who called on the President at the Flagstaff House in Accra on Monday. The request was for the creation of a new district out of the existing Wa West District, and the extension of developmental and infrastructural projects to the Area. President Akufo-Addo told the delegation that since the process for creation of additional 38 districts across the country was underway their request for the division of the Wa West District would find ‘favour’ with government. “We want this decentralisation exercise to succeed so that we get better governance of the country….,” he said. Responding to other infrastructure concerns of the delegation, President Akufo-Addo recounted the commissioning, in October last year, of the 55.5 million dollars Wa Water Project in Jambusie, at the commencement of his two-day tour of the Region. He said plans had been advanced to extend the facility to other communities in the area. “Very soon many of your water problems are going to be solved,” he said. On the state of roads in the area, the President told the chiefs that funds had been made available for contractors to return to complete roads in the Area. Also, construction work on the Senior High School would soon be completed, he said. The chiefs and people of the Dorimon Traditional Area are requesting for consideration for the creation of a new district assembly out of the existing Wa West District. Naa Gori expressed gratitude to the President for the assurance of a new district for his Area and said it would ensure an effective administration and balanced development. He said though the Government, when it created the district in 2004, had a good vision to develop the Area, the large size of the district slowed down development. Splitting the district, he said, would ensure that social interventions had positive impact on the lives of the people.